Order your Silver Star Swiss Cross Coin Cufflinks today from FahrneysPens.com. Fine Pens, Refills & Luxurious Gifts – great prices & fast shipping. 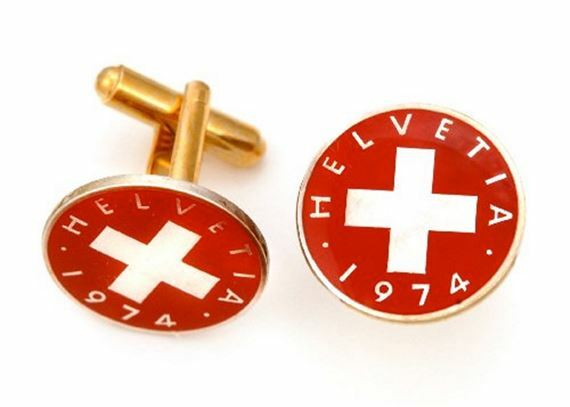 These authentic Swiss Rappen Cross Coin Cufflinks are delicately hand-painted and fired by a a U.S.-based family of artisans that specialize in the transformation of authentic world coins into collectible cufflinks. Each one is a miniature work of art. The painstakingly hand-painted using old world techniques handed down through generations. Enamels are mixed by hand at the moment of application – no two pieces are exactly alike, making each one a true original. The art is protected with layers of clear resin to add depth and luster. Gold-plated fittings hold the coins to create cufflinks that will be treasured for many years to come. These collector's items make superb gifts for any occasion!